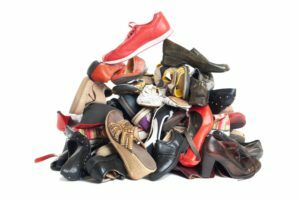 Deacon Stuart and Marlene are again organizing a Used Shoe drive on the Weekend of April 27/28 (the weekend after Easter) before and after all masses. This a great time to go through your shoe racks, closets etc. and donate any gently used footwear that are excess to your requirements or are too small for your growing children. A little background: More than 300 million people worldwide are without a single pair of shoes and this leaves them vulnerable to injuries and infections. In many places children who don’t have shoes cannot attend school,yet each year in this great country of ours millions of shoes are thrown away in landfills. Please join Brighton Collectible and Soles4Souls as they partner to collect and distribute shoes for those in need. Many of the shoes will go to places in the United States, like battered women’s shelters. those affected by a national disasters or the impoverished around the world. All different types of footwear are needed, shoes for young children and adults. The gently worn shoes can be rubber banded or tied so that pairs can stay together. Once shoes are collected, they are boxed and shipped to the designated Soles4Souls distribution center. Jerry Kohl, the owner of Brighton Collectibles pays the shipping cost. Please open your hearts and look through your closets, your time and effort will help so many!